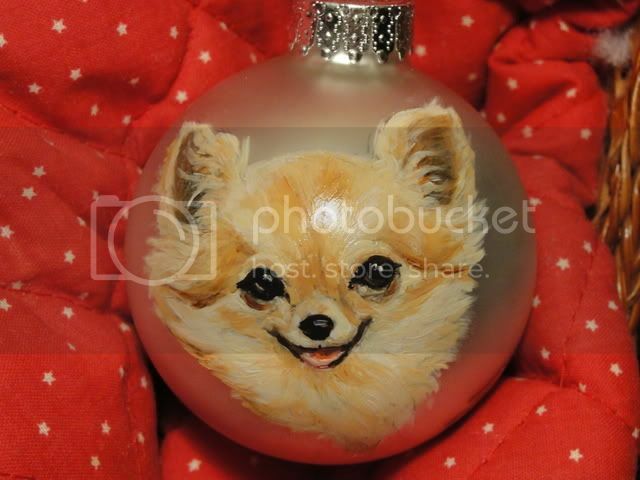 I just joined etsy as a seller and I thought I would kick off my shop with a few hand painted glass Christmas balls with dogs painted on them in oils. I'm very excited because I sold one ball already. I love creating and adding new items to my store. It's so much fun! My store name is PaintersLife. Just go to the drop down menu to sellers and type in my name. This is one of my ornaments, a long-coat chihuahua. My pictures don't do her justice. It's difficult to paint tiny features on a 2 5/8" round surface not to mention mistakes cannot be removed!